Egypt Begins Dangerous New Phase As Interim Leader Steps In : The Two-Way The coup that removed democratically elected President Mohammed Morsi from office sets the stage for what could be violent protests by his supporters. Interim leader Adly Mansour is supposed to be in office only until new elections can be held. People dance and cheer in Tahrir Square on July 4, the day after former Egyptian President Mohammed Morsi, the country's first democratically elected president, was ousted from power on July 4, 2013 in Cairo, Egypt. 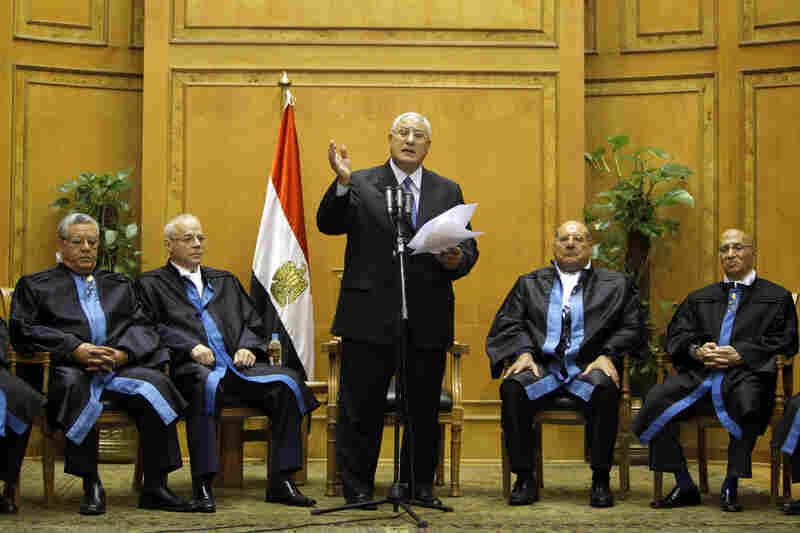 Egypt's chief justice Adly Mansour (center) speaks at his swearing-in ceremony as the nation's interim president on Thursday. 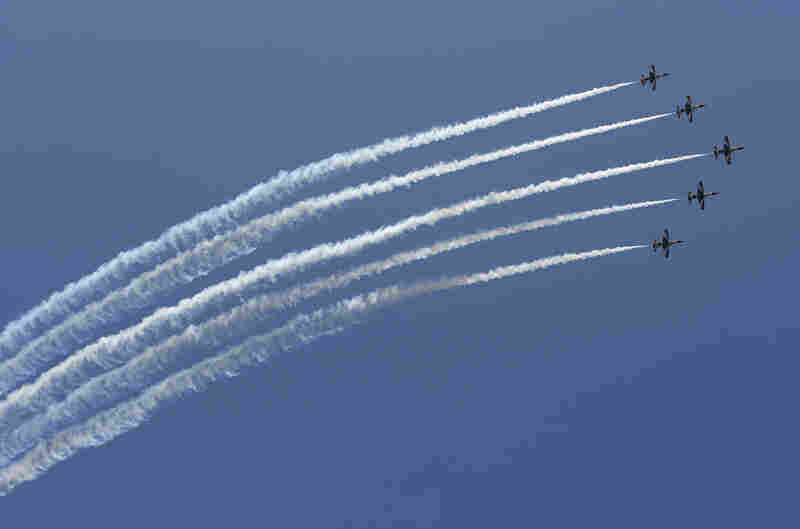 Egyptian military jets fly in formation over Cairo as Mansour is sworn in. The military says Mansour will serve only until new elections can be held. A pedestrian greets a member of the Egyptian military in Cairo's Giza district on the morning after the president Mohammed Morsi was ousted from power and put under house arrest. 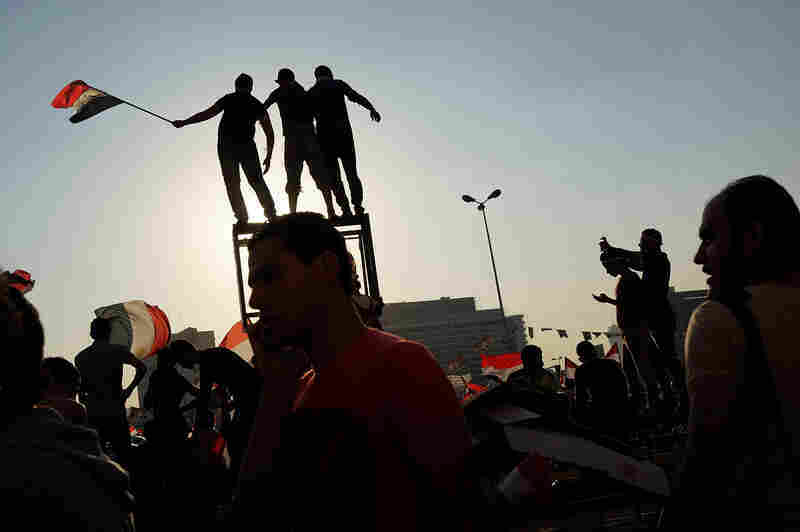 An anti-Morsi protester demonstrates in Tahrir Square on Thursday. 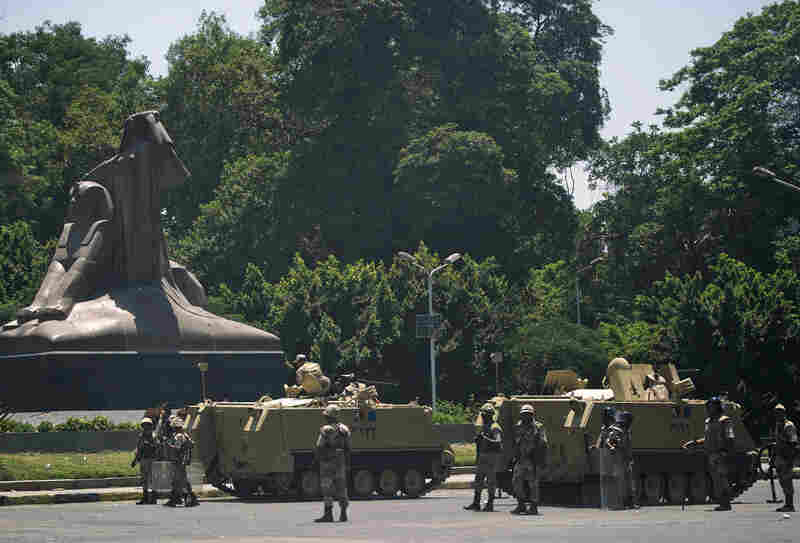 Armored personnel carriers are stationed outside the Giza Zoo on the road leading to Cairo University, where supporters of the Morsi and the Muslim Brotherhood are camped. 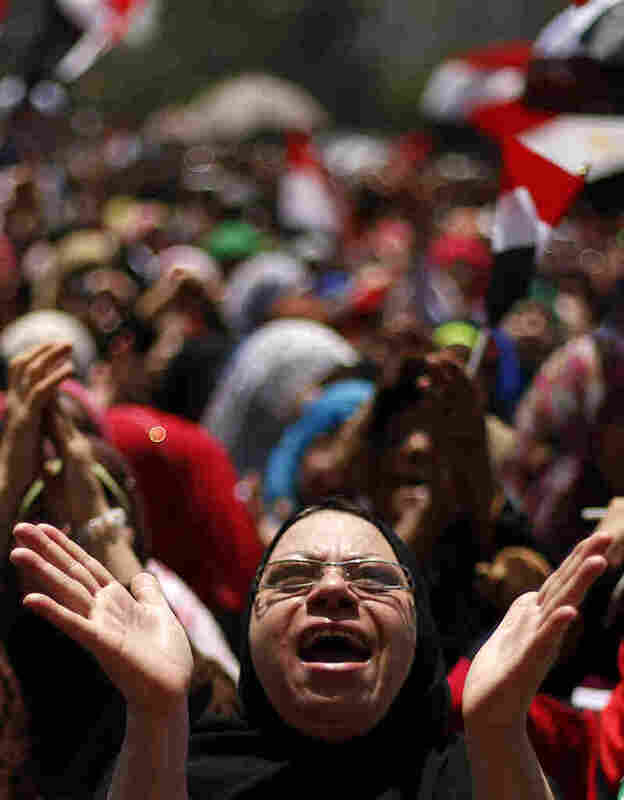 Supporters of Morsi shout slogans at the Raba El-Adwyia mosque square in Cairo. Arrest warrants have been issued for at least 300 Muslim Brotherhood leaders. 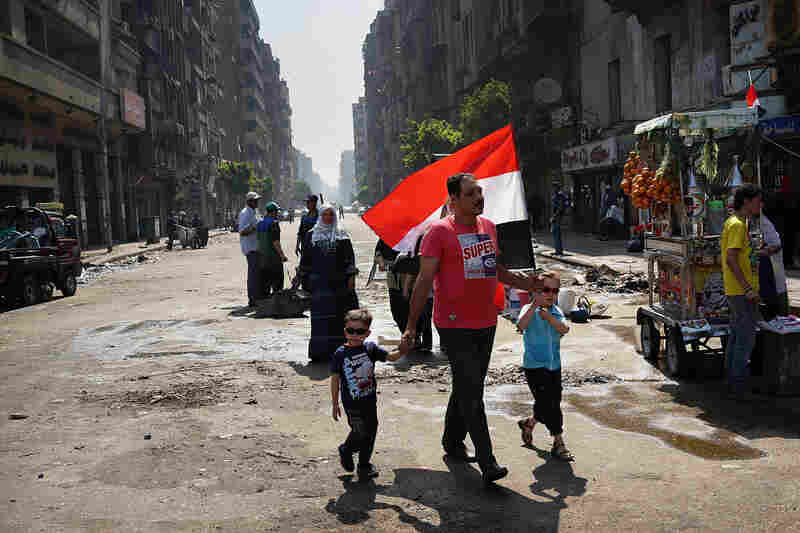 A family walks to Tahrir Square the morning after Morsi was ousted from power and put under house arrest. 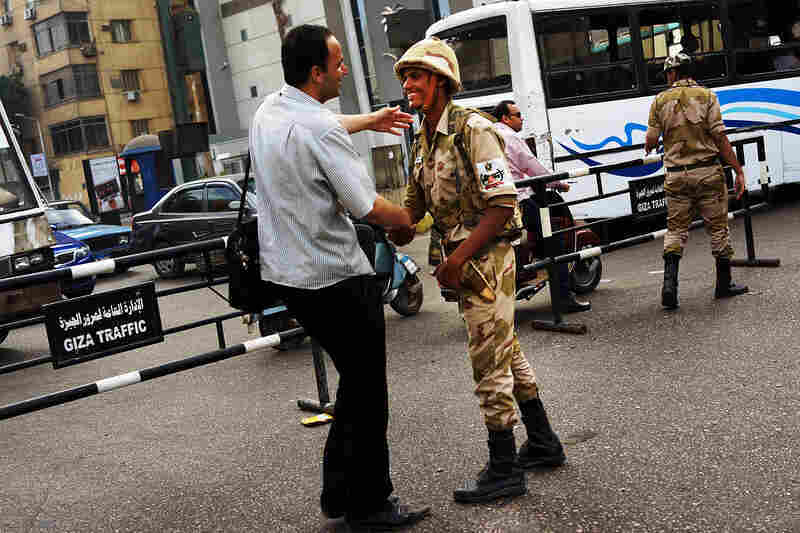 Pedestrians walk by members of the Egyptian military as they stand guard at a roadblock in Cairo's Giza district. 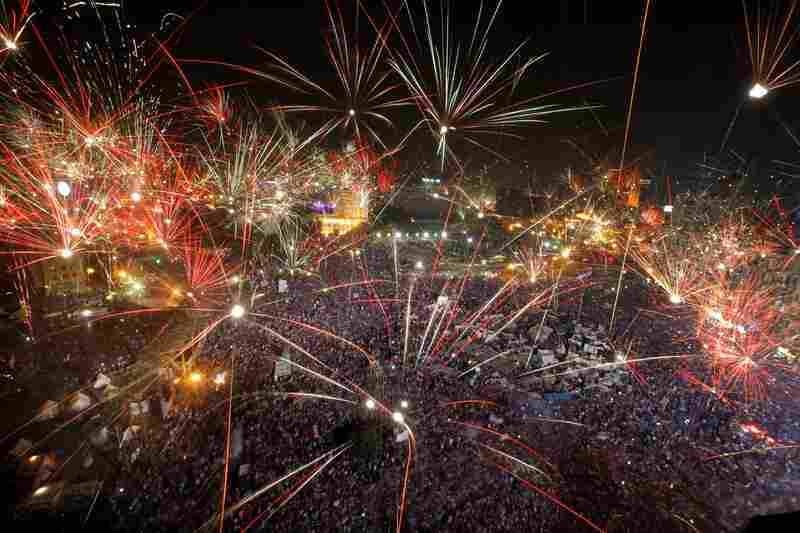 Fireworks light the sky Wednesday night as Morsi's opponents celebrate in Tahrir Square in Cairo. 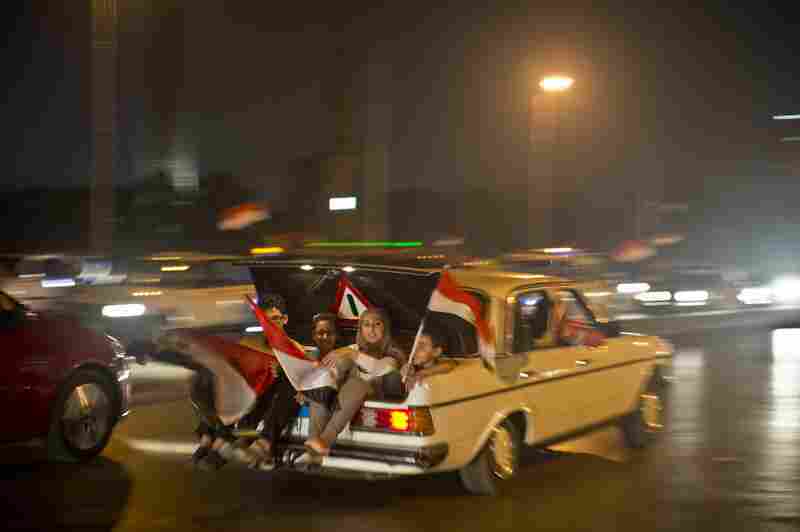 An Egyptian family rejoices in Cairo after a broadcast Wednesday confirming that the army has forced Morsi out of office. Anti-government protesters celebrate Morsi's ouster outside the presidential palace in Cairo. Egyptians hug and kiss an army soldier. The military has expressed concern about limiting violence following news of Wednesday's coup. With President Mohammed Morsi out of sight and reportedly in military custody, Egypt has begun yet another dangerous new phase in its fitful transition to democracy. The nation is under the temporary leadership of interim President Adly Mansour. He and the military leaders who pushed Morsi from power now face the likelihood that the ousted president's supporters will — as some promised they would if he was removed from office — fight back. Mansour, the 67-year-old chief justice of Egypt's Supreme Constitutional Court, was formally installed in his new role early Thursday. He has been placed in his new post by the country's military, which on Wednesday removed Morsi from office just one year after he became Egypt's democratically elected leader. The military says Mansour will serve only until new elections can be held. It has also suspended the nation's constitution. As we reported Wednesday, President Obama says the U.S. is "deeply concerned" about the Egyptian military's actions, and he called on Egypt's generals to "move quickly and responsibly to return full authority back to a democratically elected civilian government." 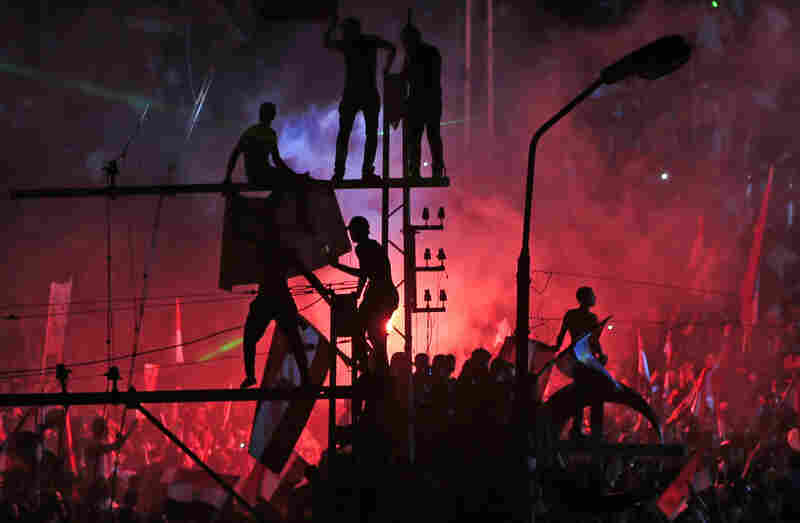 The coup came after several days of massive, sometimes violent, protests against Morsi's government. Millions of Egyptians took to the streets to express their anger over the country's deep economic problems and what they saw as the ineffectiveness of Morsi and his Muslim Brotherhood colleagues. It was an ironic fall for the president, who came to power in the wake of equally massive demonstrations in early 2011 that led to the toppling of President Hosni Mubarak's regime. 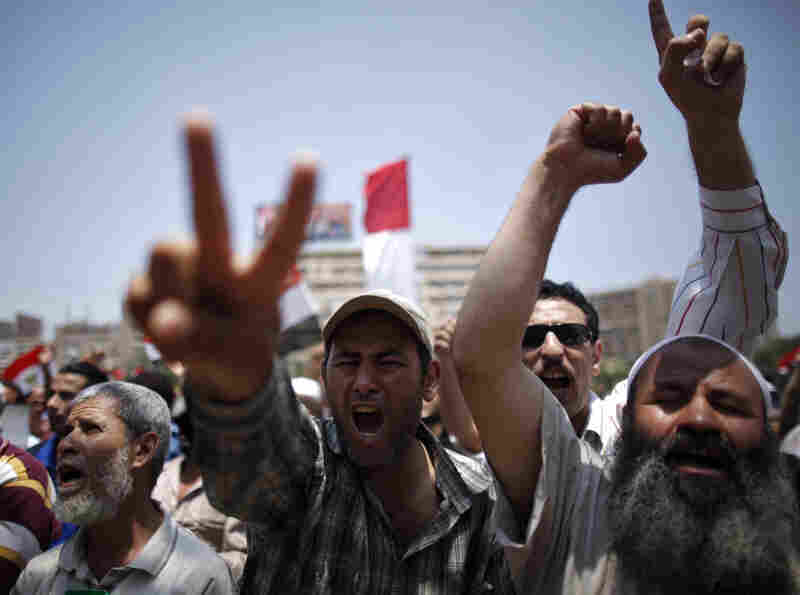 As NPR's Greg Myre writes on the Parallels blog, the Arab Spring has become a roiling Arab Summer. On Morning Edition, NPR Cairo bureau chief Leila Fadel spoke with Heba Morayef, director of the Middle East and North Africa division at Human Rights Watch. "Morayef says a coup is a dangerous precedent to set," Leila reported. "Some Brotherhood supporters have resorted to violence across the country. As have opponents to the Brotherhood. And the country remains dangerously polarized as the political elite on both sides demonize the other, she says. Opponents to the Brotherhood refer to them as terrorists. Men have been dragged by their beards on the side of the road on suspicion of being in the Brotherhood, Morayef says, fearing that now the military is joining in." Arrest warrants have been issued for at least 300 Muslim Brotherhood leaders. Also on Morning Edition, NPR's Soraya Sarhaddi Nelson said the Egyptian military "has expressed great concern about keeping the peace and limiting the bloodshed" as Egyptians react to Wednesday's coup. "The fear is that if they don't ... go after these leaders, a resistance or a backlash will be organized." But, Soraya added, Muslim Brotherhood members say the hunt for their members is a "return to the enmity of the past," when there was a crackdown on the Islamist group by the Mubarak regime. "They are still out there" and taking their concerns to the streets, Soraya said of the Brotherhood's millions of members. "The question is, will they stay out there in large numbers" as the military clamps down? The Egyptian armed forces said on Thursday they would not take arbitrary measures against any political group and would guarantee the right to protest, as long as demonstrations did not threaten national security. "Peaceful protest and freedom of expression are rights guaranteed to everyone, which Egyptians have earned as one of the most important gains of their glorious revolution." That promise might be put to the test in a few hours; the Muslim Brotherhood is calling for mass protests on Friday. Egypt's Foreign Minister Mohamed Kamel Amr says the ouster of President Mohammed Morsi was not a military coup, Reuters reports. Amr spoke with U.S. Secretary of State John Kerry and foreign ministers of other nations on Thursday, calling Morsi's removal "the overwhelming will of the people." Amr, who is serving as interim head of Egypt's foreign ministry, says the road map for new elections will also honor the people's will. "There is no role, no political role whatsoever, for the military," he said. "This is the total opposite of a military coup." "Kerry had assured him, Amr said, that Egypt was a strategic ally whose stability was important. Kerry also asked about human rights and the Egyptian minister said there would be no acts of vengeance against Mursi and his Muslim Brotherhood." Defining whether what happened was a coup or not is important, as the AP noted earlier this week; it could affect the $1.5 billion in U.S. aid to Egypt. It could also trigger economic sanctions. "The deposed president is currently in military custody along with 12 of his aides," correspondent Merrit Kennedy, who's in Cairo, tells our Newscast Desk. 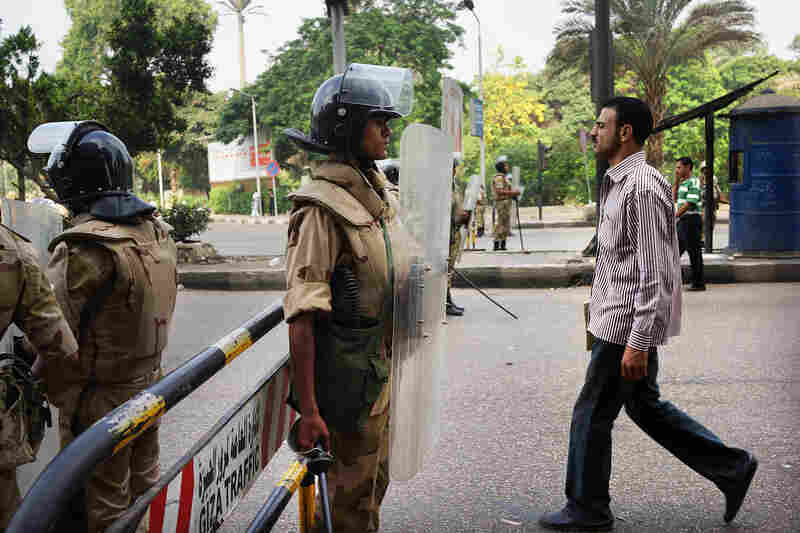 An Egyptian security official tells NPR's Leila Fadel that Muslim Brotherhood leader Mohammed Badie has been arrested. That mirrors reports from other news outlets, including The Associated Press, which says Badie has been flown to Cairo from a "resort village in Marsa Matrouh, a Mediterranean coastal city west of Cairo not far from the Libyan border."